In honor of Curiosity’s successful landing on Mars last night, I thought I’d share this piece of artwork. 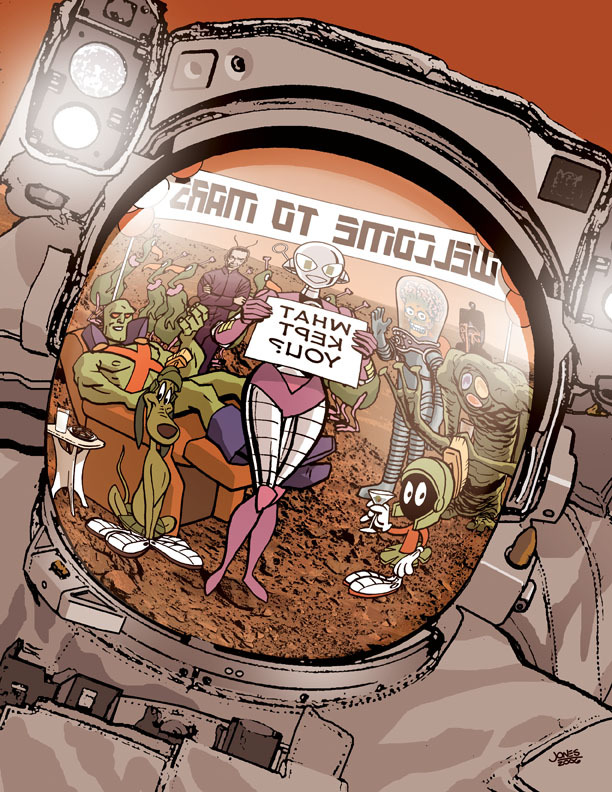 This was originally done as a Souvenir Program Guide cover for CONvergence, back in 2006 for the convention theme of “Boldly Go.” It features the CONvergence mascot Connie and a few familiar friends. Can you identify them all? Congratulations to everyone at NASA and the Jet Propulsion Laboratory on this fantastic accomplishment! Misc Artwork | Christopher Jones | August 6, 2012 5:27 pm | Comments Off on Welcome to Mars! Last Who of the day? 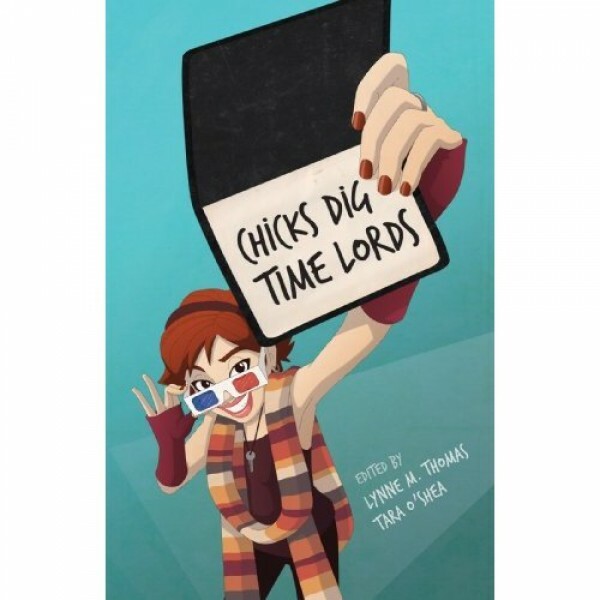 I was reminded that I neglected to include the badge art for CONvergence 2011 Guest of Honor Lynne M. Thomas, who along with Tara O’Shea edited the Hugo Award-winning Chicks Dig Time Lords from Mad Norwegian Press, a collection of essays offering a female perspective on Doctor Who. 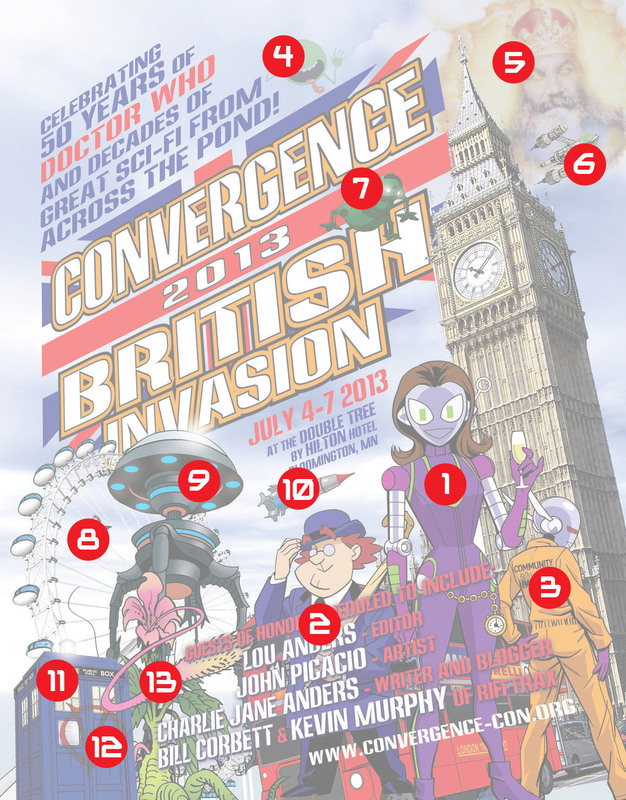 The badge art features CONvergence mascot Connie inserted into the Chicks Dig Time Lords cover art by Katy Shuttleworth. Conventions, Doctor Who | Christopher Jones | November 23, 2011 2:44 pm | Comments Off on Last Who of the day? 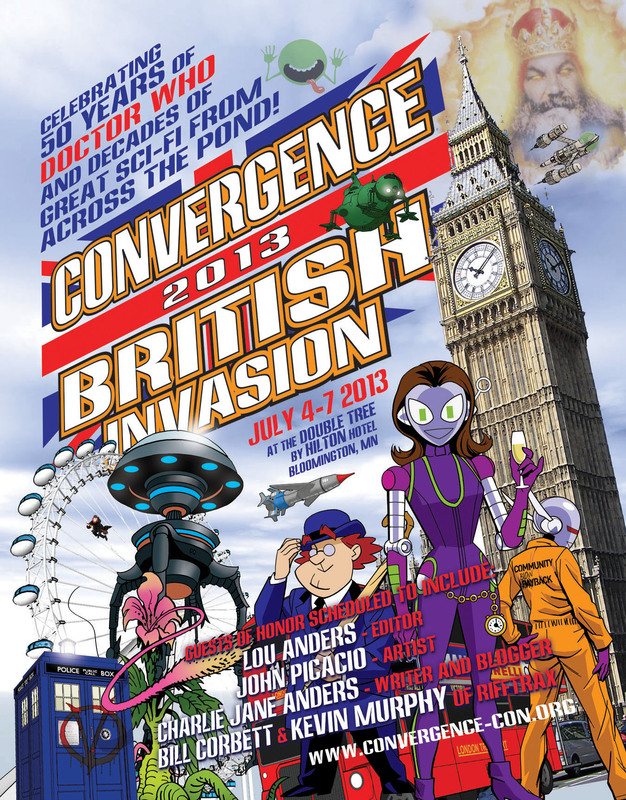 I’ve done a little Doctor Who-related artwork over the years for CONvergence, the SF convention I helped start back in 1998. Here’s Connie (the CONvergence robot mascot) dressed as all of the first 10 Doctors (yeah, I know I need to add Matt Smith). And here’s Connie’s slightly evil sister Connie Mark 2 dressed as the 6 incarnations of The Master. CONvergence 2003 had the time travel theme of “Time Flies.” The highest on-duty authority at the convention got a badge that said “Exec on Duty,” and every year I tried to find an authoritarian, theme-appropriate image to put on them. This is what I came up with in 2003. And finally, this was the badge that year for the convention Directors, who were then also the the Board of Directors of the non-profit parent organization MISFITS. This was a T-shirt design four CONvergence 2007, our Creature Feature year. That’s Connie in front introducing a few of our favorite “Things.” Can you identify them all? BTW – The art on this T-shirt glows in the dark!